Picture yourself in a landscape of windswept snow and ice, gazing across a vast expanse of white to where the horizon blurs into a sky of crystalline blue. And then imagine looking down, alone with your thoughts in the haunting emptiness, and seeing the pattern of your boot prints on ice that Amundsen or Scott may have trudged across more than a century ago. Adventurous travelers often talk about journeying to the ends of the Earth, but rarely do they mean it quite as literally as this. If you’ve ever dreamed of following in the footsteps of the great Antarctic explorers – not just to the edge of the White Continent, but on to the southernmost point at its barren heart – TravelQuest offers you the experience of a lifetime: a January 2018 expedition to the geographic South Pole. We’ve made this journey 5 times before, most recently in 2014. One thing we can say for certain: journeying to the South Pole is an adventure that forever changes how you look at the world. It’s also an opportunity to capture the kinds of images that have lived in your imagination for a lifetime. Antarctica is a photographer’s paradise, whether you’re a seasoned professional or an avid beginner. Surrounded by vistas of craggy mountains, blue-tinged glaciers, and wind-sculpted snow – all beneath magnificent skies, thanks to an atmosphere miraculously free of dust – you find moment after moment that you want to hold in your memory forever. TravelQuest’s expedition begins in the Patagonia region of Chile, at the southern tip of South America. In the historic port of Punta Arenas you board a chartered transport jet to fly across the Southern Sea and deep into Antarctica. Your destination is one of the remotest landing strips on Earth, the blue-ice runway on Union Glacier – at 79° South, approximately 1,500 km (950 mi) inside the Antarctic Circle. The Union Glacier Base Camp, established in 2010, is the only private facility of its kind in the interior of Antarctica and serves as your home throughout the expedition. 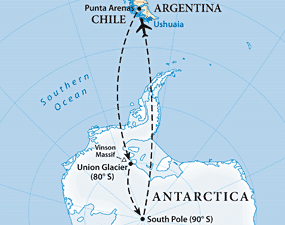 After acclimatization at base camp, you board a smaller plane (either a Douglas DC-3 TP67 or a de Havilland Twin Otter) and fly on to the South Pole. 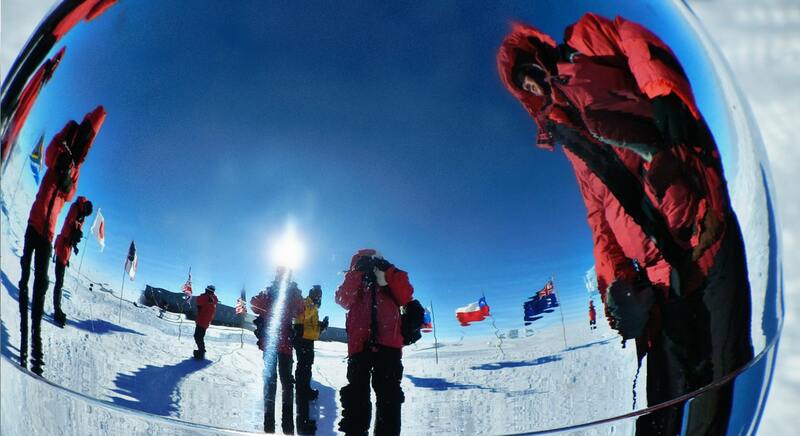 Here you can walk to both the commemorative marker and the precise geographic point at 90°S – as well as to the Amundsen-Scott South Pole Station. Your overnight stay at the Pole is the crowning event in a multifaceted adventure unlike anything you’ve experienced before. In the middle of a harsh continent that has attracted so many explorers and adventurers, all sharing a passion for the Earth’s last frontier, you find a stark and mysterious beauty – and a sense of endless distance that inevitably inspires you to look inward.